For a cake that’s named after a vegetable, carrot cake is usually packed with copious amounts of sugar and oil. These scrumptious bliss balls are not. They’re wholesome, nutritious and naturally free from gluten, dairy, egg and refined sugar! 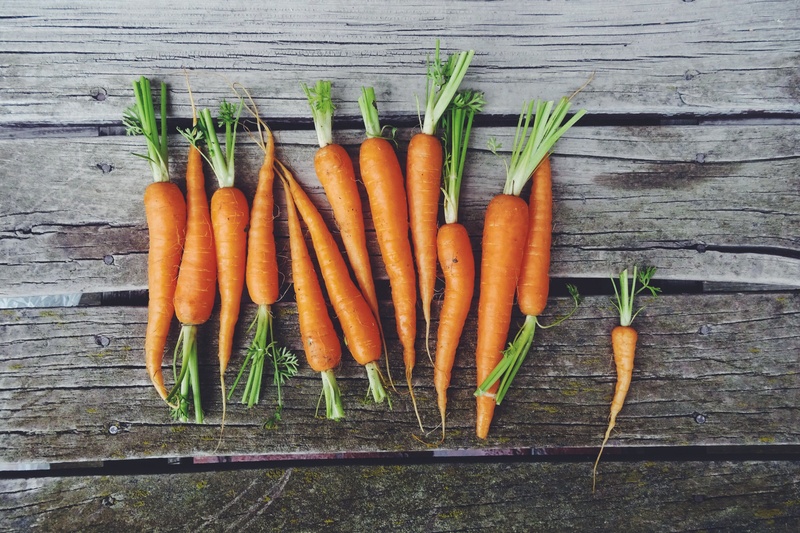 Carrots are one of the best vegetable sources of beta-carotene, which the body converts to vitamin A. Vitamin A keeps our skin, hair, nails and eyes beautiful by promoting natural cell division, regenerating collagen, regulating oil production, and slowing the natural deterioration of eyesight as we age! So go on, make a batch, it’ll take you less than five minutes and your body will LOVE you for it (so will your tastebuds). Definitely an “I accidently ate the whole thing” dish. But, I don’t carrot all! (See what I did there?). Place all ingredients in a food processor and blend for a minute or so until the ingredients begin to stick together (similar to a dough-like mixture). To finish, coat the balls by rolling them in the remaining coconut. Refrigerate for a few hours before nomnom. We are having a truffle competition at work this week – I’ll give these a try! I promise you’ll win with these!! These looks amazing. I can’t wait to try this recipe! Love the idea of these but ours were really wet. Also used a very overpowering honey. Going to try again, fingers crossed! Love the idea of these but for some reason ours were really wet. Also used a very overpowering honey. Going to try again! Mmmm they look soo yummy!! I love healthy snacks that taste like dessert! Love the beautiful carrot pic. I’ll be trying these for sure! It is really exciting to see the effort that people (such as yourself) put into creating delicious dishes using ingredients the body thrives on. With so much disease and weight issues, you prove that healthy living does not require sacrificing food choices. Well done! You don’t need to boil the carrots beforehand? If these snacks are as good as they sound, as good as the tahini and sesame ‘fudge’ snacks (got me through the traditional unhealthy food season without harm), Roo hugs may be in order! Mmm – these sound so delicious! I might try a version of these actually, just need to figure out how to replace the honey, dates blended with a little water? Maybe even coconut oil. Thank you! Will definitely try these! What a great idea! Yum! yum! This is so creative. Will be making these in the near future. Thanks for sharing. We are carrot cake lovers! Yum. These look awesome! I forwarded the recipe to myself! 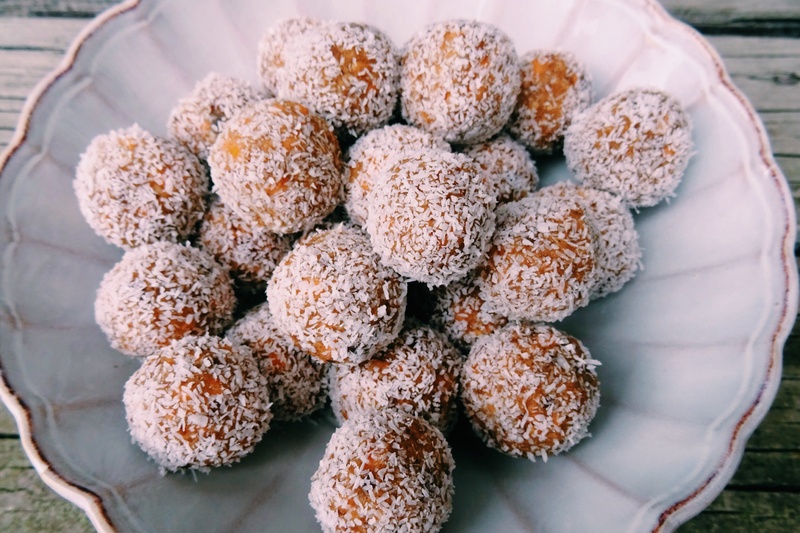 My Mom makes some incredible date and coconut balls — I have to ask her where that recipe is. She would freeze the date balls forever…No problem with most baked goods to freeze for a long time. Eat them only slightly thawed, best! Midnight freezer raids! :) Her carrot ring recipe was great, but it’s lost and gone. It was traditional Thanksgiving side. Yum date balls sound great! Mums’ recipes are best! How is it going over there? How’s the weather? Are you well? Genki? That means healthy in Japanese. Well, we’ll all be celebrating happy days of Iranian origin soon: Nawruz and Purim, so I’ll be thinking of you! Meanwhile, Spring has sprung! Kitty is cuddly and sends you purrs in Purrsian; I just send them in Pers-on. <3 Genki? That is not as timorous as a good ole hearty, Briyut! Tehehe wish you could send them in person! Alas, you’re far far away in Mystery Land. I am so excited for my parents.. 11 days today! Ahhh. Also, 1 hour and 15 minutes of work left! Looking forward to going home, resting and watching a movie tonight recommended by Lifa, my Israeli friend. It’s called Searching for Sugarman. Know anything about it? You should put a countdown widget on your blog! Sounds like a good plan. Don’t think I’ve heard of the movie; occasionally I read blurbs about them, though, so I might’ve. I knew some guys with that last name once, so changing the context gives it a whole new, and strange, meaning! Maybe I’ll go look it up. Here, catch: xoxo! Why can I not like this more than once…? They ARE delicious! Please try them! I’m seriously no good in the kitchen but I’m going to give these a try. I really hope you do! If the mixture feels too wet add more almond flour and too dry add a little water! It should be fine though! Soft-dried dates or raisins work as well (in place of dates – if you wish). Just made some. Replaced almond meal with mixed pumpkin and sunflower seeds, and coconut with vanilla flavoured protein powder. They’re in the fridge but can’t wait to try!